Although I’ve been posting comics online since 2010, I only really got back into it (after a one-year hiatus) in 2015. Since I’ve made a fair number of comics since then and have many more planned for the future (since I make my comics quite far in advance of publication), I thought that it would probably be a good idea to compile an index of links to my current comics and (time-specific) links to my future projects. I’ll be adding commentary about each comic beside the link. Comics which haven’t been released here yet (even though they may have been released on DeviantART) will have a date beside the link, which will tell you when the link should be active [in GMT time zones]. Because I tend to post collections of comics/comic pages at the very end of a particular day, the date may be a day later than the actual release date. -“Dead Sector“: This was the very first comic I made when I got back into making comics. It’s a short B&W sci-fi comedy zombie comic (inspired by old American horror comics, amongst many other things) and it’s one of my favourite comics from 2015. – “Conspiracy 1983“: This was the next comic I made in 2015 and it was meant to be a comedy sci-fi thriller set in a dystopian version of 1980s America. It didn’t really turn out quite as well as “Dead Sector” did and it’s somewhat shorter. – “Diabolical Sigil“: This was my very first attempt at re-booting my old “Damania” webcomic series, albeit as a short B&W narrative comic. Although I no longer consider this comic to be canonical, it’s also one of my favourite comics from 2015. – “The Horror Of Hardtalon Hall“: This was a B&W comic that I made for Halloween that, once again, features the characters from my long-running “Damania” webcomic series. Although this comic went fairly well, the ending was somewhat rushed and I’m not completely satistfied with it. Like with “Diabolical Sigil”, I no longer consider this comic to be canonical. – “Damania Redux”: This was another attempt at re-booting my “Damania” webcomic series. This time, I decided to re-boot it in “mini series” of traditional full-colour webcomic updates. This mini series is officially only twelve comics long, but there is a “deleted” thirteenth comic. – “Damania Resurgence“: This is the second “Damania” mini series (boasting 15 entire comic updates this time) and, despite one of my pens running low on ink whilst I was making it, I consider this mini series to be one of the better ones of the earlier mini series. – “The Charity Case: A Harvey Delford Mystery” : This is a stand-alone film noir detective/comedy comic, starring Harvey from my “Damania” webcomic series. – “Damania Returns“: This is, if I’m being honest, my least favourite “Damania” mini series. Although it is, at the time of writing, the longest mini series (at a gargantuan 17 updates) I was plagued by writer’s block during it’s creation and the quality of at least several updates suffered as a result. – “Damania Referendum“: This is a short series of four comics showing how each of the four characters in my “Damania” webcomic series will vote (and, more importantly why) in the EU Referendum. This mini series was (relatively speaking) kind of a last-minute thing, but I quite like how it turned out. – “The Let’s Play“: This is probably my least favourite comic of 2016. It was intended as a spin-off comic about Derek and Rox from “Damania” making a “let’s play” video for Youtube. But, due to being rushed, the quality of the art and the writing in this comic is somewhat below par. – “Damania Restricted“: After the lower quality of the previous two comics, I decided to take a step back and make a much smaller webcomic mini series, where I could focus more on quality rather than quanitity. This resulted in this little six-part mini series that helped to restore my confidence in making comics. – “Damania Resurrected“: This is another 14-part “Damania” webcomic mini series and, for the most part, I was really pleased with how this one turned out and at least a couple of strips from it are some of my absolute favourites. However, after making it, I decided to take a 1-2 month break from making comics. – “Damania Reappears“: After nearly two months without comics, my “Damania” series will reappear with this 14-part mini series. This one was an absolute joy to make and it also contains what I consider to be one of the funniest comics that I’ve made this year. – “Zombies Again!“: This is 2016’s Halloween comic and, in keeping with tradition, it will be a B&W comic that features the characters from my “Damania” webcomic series. This is probably my favourite B&W comic from this year. Have you ever wondered what would happen if Roz, Derek, Harvey and Rox found themselves in the middle of a zombie apocalypse? Well, now you know. – “Damania Revived“: This will be the seventh “Damania” webcomic mini series. At 12 comics in length, it’ll be slightly shorter than the previous two mini series have been (due to occasional writer’s block). Even so, the quality of this mini series is still (mostly) just as good. – “Damania Regrown“: This is the eighth “Damania” webcomic mini series. Like with the previous one, it is twelve comics long, although it features improved artwork and some of the comics are slightly more philosophical/sophisticated than usual too. – “My Ten Favourite ‘Damania’ Comics Of 2016 (With Commentary)“: Want to know what my ten favourite “Damania” comics from this year were? Well, this article will both show and tell you. – New Year’s Cartoon: This is a single-panel cartoon featuring the characters from my occasional “Damania” webcomic series. Although it will be posted here in the evening on New Year’s Eve, I thought that it was fitting to start the “2017” part of this page with this particular cartoon. – “Damania Resolute“: This is another 12-comic “Damania” mini series, with a couple of vaguely topical comics about January. Since I had occasional writer’s block when preparing this mini series, I really like six of the comics in this mini series, but feel that the other six should have been better. So, there are some great comics here if you don’t mind sifting through a few mediocre ones too. – “Damania Retrofuturistic“: Following a freak calculator-related accident, Roz, Derek, Harvey and Rox are catapulted forwards in time to a 1980s-style cyberpunk future in this 10-comic mini series. This is probably one of my favourite mini series so far, although – unlike most of the other mini series – this one is best read in order (although most of the comics are fairly self-contained). – “Damania Renaissance“: Following another freak calculator-related accident, Rox, Derek, Harvey and Roz find themselves in the middle ages! Yes, this is a [mostly self-contained] 8-comic sequel to “Damania Retrofuturistic” and the second part of my “Time Travel” trilogy. This mini series is unusual in that it also actually has something of a continuous storyline too, which is something I’d previously tried to avoid in these webcomic mini series. – “Damania Requisitioned“: Ahoy there, mateys! This be a pirate-themed “Damania” mini series. There arr 12 episodes for ye, an’ it actually sort of has a prop-arr storyline about piracy on the high seas, ye scurvy lubbers! Yo ho ho and a bottle of rum! – “Damania Reverie“: After falling asleep whilst reading a Raymond Chandler novel, Harvey finds himself in the middle of a chilling “film noir”-style mystery that only he can solve! This 10-episode mini series is probably the most “serious” Damania comic [Edit: Don’t worry, it’s still a comedy comic though] that I’ve made and it actually also even has a continuous story too. – “Damania Revelry“: Well, it’s summer and that means that it’s time for Roz, Derek, Harvey and Rox to go to a festival (seriously, the last time they went was in 2013). Unlike quite a few of my more recent mini series, this eight-comic series is a more “traditional” style one that mostly consists of self-contained updates (rather than some self-contained updates and some story-based updates). – “Damania Recovery“: It’s Harvey’s birthday and Roz has arranged a murder mystery-themed party for him. Needless to say, Harvey’s famed deductive skills won’t go unused.. Plus, although this mini series is only a miniscule six-comic series, it contains one of the funniest endings I’ve written in a while. – “Damania Replicated“: In the distant future, two scientists decide to create some robotic cyborgs from the genetic material of four 21st century people. No prizes for guessing which four people… This twleve-comic mini series is a combination of story-based comics and stand-alone comics, and it’s sort of a spiritual successor to my cyberpunk “Damania Retrofuturistic” and “Damania Regenerated” mini series. – “Damania Relaxation“: This is a random assortment of six “old-style” comic updates that I made when I realised that I’d gone for more than a month without making any comics after I’d finished “Damania Replicated”. I was mildly uninspired when I made it, and it’s probably my least favourite mini series of the ones that will be posted in 2017. – “Damania Resized“: Woo hoo! Good “Damania” comics return in this six-comic mini series 🙂 After the failure of the previous mini series, I reworked a few things (such as increasing the comic size). Although I stuck with my decision to go back to making self contained “newspaper comic”-style comics, I decided to keep the more detailed artwork that I’d used in a lot of my “story-based” comics from earlier in 2017. – “Bonfire Night 2017“: This is a single-panel comic, featuring the characters from my long-running webcomic, that I made for Bonfire Night (Nov 5th). I’d planned to make one of these for 2016, but didn’t get round to it at the time -so, I wanted to make one this year. – “Damania Revitalised“: This is a mini series that consists of six stand-alone comics (using the new A4-size format). Although, due to the lack of planning, it isn’t the best mini series that I’ve made – it’s hardly the worst either. Basically, some of the comics are reasonably good and a couple are slightly rushed. – “Damania – A Cynical Christmas (2017)“: This is a follow-up to last year’s Christmas mini series and it includes another six self-contained festive comic updates 🙂 Plus, there will also be a seventh (single panel) comic posted here at noon (GMT) on Christmas Day. – “New Year’s Cartoon“: Although this cynical comic (featuring the characters from my occasional long-running webcomic) will appear on New Year’s eve, I thought it was a good thing to start the ‘2018’ segment of this page with. – “Damania Refracted“: Although this mini series of six self-contained A4-size comic updates wasn’t as inspired as the previous one (I even re-made a comic from 2013 at one point! ), it still turned out reasonably well. – “Wordless Comics“: Well, this is an experimental five-comic mini series that is very different from my usual comics. Basically, in order to avoid an uninspiration/ unenthusiasm-based webcomic hiatus, I had to try something different. Eventually, I settled on the idea of ‘comics without any words‘ and suddenly, I found that I’d made five of the most artistically detailed, intellectually complex etc.. comics that I’ve made in quite a while. – “Damania Regression“: Woo hoo! “Damania” comics are back! Although this six-comic mini series returns to the old 4-5 panel format (and the art quality varies quite a bit from comic to comic), it’s one of the funniest mini series that I’ve made in a while. – “Damania Resurfaced“: This six-comic mini series is a bit more of a cynical and character-based one. Like with the previous mini series, I’ve returned to the old format. This mini series also features slightly more realistic shading too. – “Damania Retroactive” : I decided to go back to making narrative comics in this six-comic mini series. This is another “time travel” comic and, this time, the four main characters travel back to the distant year of… 2017. – “Damania Resort“: This eight-comic mini series follows on from the ending of “Damania Retroactive” (but can also be read as a stand-alone comic) and it involves Harvey solving a complex conundrum of a case. Well, it’s been quite a while since he last had a case. – “Damania Reconnected“: After returning home from a surprisingly dull ten-month holiday, Roz, Derek, Harvey and Rox are just settling back in at home when there is a sudden power cut. Needless to say, hilarity ensues. And, yes, this is a proper six-comic mini series (unlike last month’s filler comics). – “Nocturnal“: Well, in several years of making Halloween comics, I’m seriously surprised that it’s taken me this long to make one in the vampire genre. Still, if you’ve ever wondered what would happen if Roz, Derek, Harvey and Rox accidentally ended up meeting some vampires, you’re in luck…. – “Bonfire Night 2018“: Like last year’s Bonfire Night comic, this is a quick single-panel comic featuring Roz, Derek, Harvey and Rox watching a fireworks display. – “Damania Revisited“: Do you miss the old-school “Damania” comics from 2012/13? Well, you’re in luck! Due to writer’s block, this mini series is a collection of six modern remakes (with improved art and writing) of some of these classic comics. Plus, there will also be an extra single-panel Christmas comic posted here at 12 noon (GMT) on Christmas day too. – “Damania Reduced“: This is a slightly shorter mini series of four comic updates. Basically, I was somewhat busy at the time, but I was determined that some comics would be posted here in January. – “Damania Requirement“: This four-comic mini series ended up being better, and funnier, than I expected 🙂 Plus, although I’m still experimenting with photo-based backgrounds, the first comic in this mini series is a more “traditional”-style comic update (with no photos in it). – “Damania Retracted“: Well, due to a slightly rushed production/planning schedule, this four-comic mini series includes a couple of “topical” comics about stuff that happened in 2018. Still, for a rushed mini series, it turned out better than I’d expected. 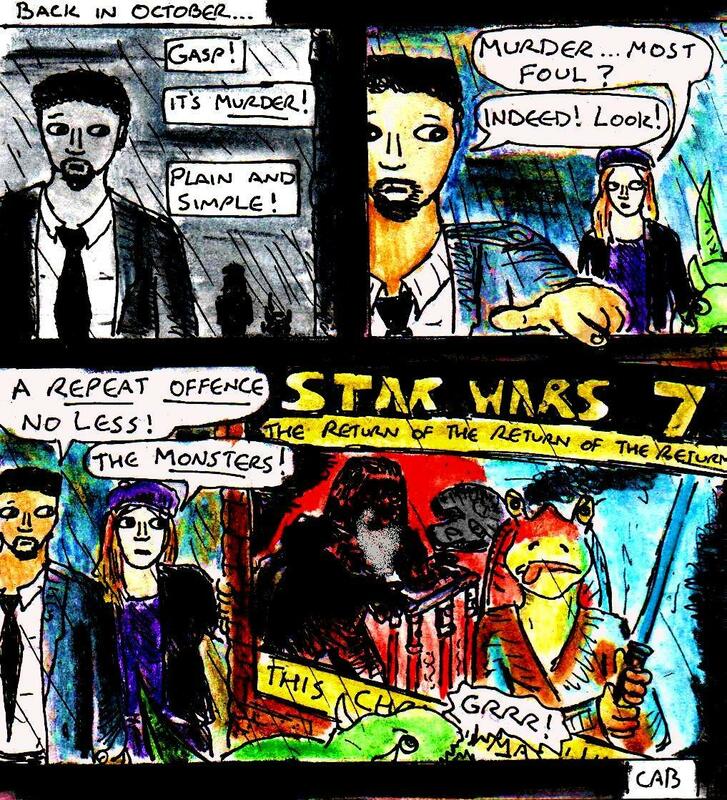 – “Damania Resuscitated” [24th May 2019]: This is a four-comic mini series, which turned out better than I had expected (given the relative lack of planning time). Surprisingly, this mini series is also one of the first ones where I added literally all of the colours to the comics digitally. – “Damania Reluctantly” [22nd June 2019]: Well, due to the hot weather at the time of production, this mini series ended up being a slightly random and non-canonical two-comic mini series. On the plus side, this mini series not only features “old-school” watercolour art, but it also features a couple of cameos by yours truly as well. – “Damania Doodle II” [24th August 2019]: Well, here’s the eagerly-anticipated sequel to “Damania Doodle” 🙂 And, yes, like with last August, I was too busy to plan/make a full mini series. So, this one consists of four single-panel monochrome filler comics. – “Slasher” [1st November 2019]: It’s nearly Halloween, and there is a masked serial killer on the loose! Needless to say, Harvey is overjoyed that he finally has a case to solve. – “Bonfire Night 2019” [6th November 2019]: This is a rather quick single-panel cartoon, featuring Harvey, Roz, Derek and Rox, that I made for bonfire night. However, due to time reasons, the size/format of the cartoon is slightly different to usual. – “Damania Revisited II” [25th November 2019]: Here’s the long awaited sequel to “Damania Revisited“, featuring four more modern remakes of classic comics from 2012/13. And, yes, I didn’t have time to plan any new comics for this month. – “Damania Recanted” [24th January 2020]: Well, due to both writer’s block and a lack of planning time, this four-comic mini series probably isn’t one of my best ones. – “Month Off” [21st February 2020]: Due to writer’s block, being busy and other things, I didn’t really feel like making a full mini series this month (and I’m not sure about future months). Still, I felt like making at least one single-panel comic for this month. – “Another Month Off” [21st March 2020]: Well, since I was still too busy to plan out a full mini series, I ended up making another single-panel filler comic for this month.